First I want to thank Rodney and crew for doing an outstanding job of preparing the track so we could race today....It's not every track owner that would break out the motor grader to take 3 inches of mud off the track to get in just one race....It was super fast too....Devin set pole in Animal Heavy with a 12.25....Too bad the rain came right after Animal lite took the track for their feature race....Nothing could be done after that. Somebody got a killer pic of Devin flipping his kart on the first lap of the day....Those tires had more bite than any we have ever ran...Devin and kart were fine, minus the chain that came off, he just rolled it back on, I re-cranked the kart and he was fastest kart on the track for first round of practice....On a typical Dawgwood early wet track U have to pitch the kart in turn 3 to scrub some speed or hit the fence coming out of turn 4....Well when he made that move the tires had so much bite the kart caught and just flipped right over. 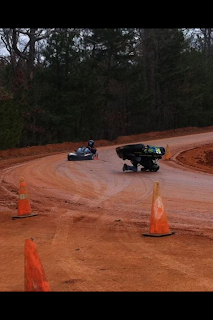 We learned a thing or two today, figured out what to do to get bite when the track is wet...I think we will end up leading points in Animal Heavy and our team mate is leading in Animal Super Heavy...Looking forward to the Jan. 21st winter points race...See Ya'll there.